About 1965. Photo courtesy of Eric McGuire. The following article was supplied by the station. 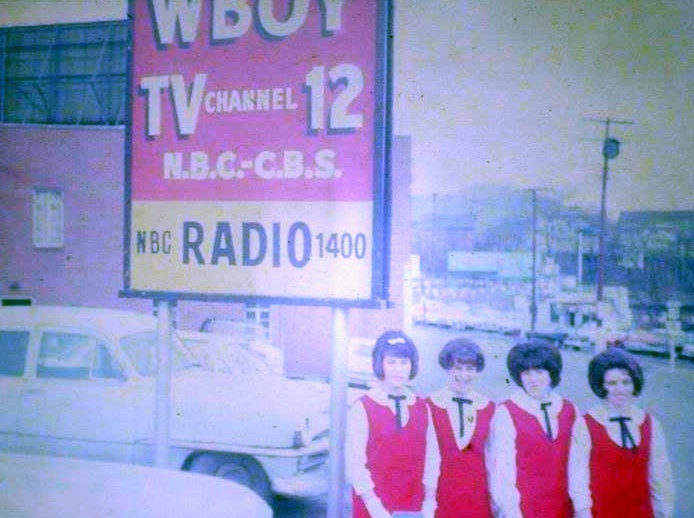 WBOY-TV, Channel 12, was the first television station in the Clarksburg market and probably the only TV station in the nation in a market where a cable company (one of the largest in the country at that time) preceded the TV station. Originating its first broadcast in November, 1957, the license was granted to the Friendly Group...the corporation name later changed to Rust Craft Broadcasting under the same ownership with the late George Clinton as manager. Harry S. Brown (also deceased), as chief engineer; Peter Lyman, news director; and Robert W. Toothman, program director, both deceased; Milt Furner, news photographer (retired). In 1959, Roger Garrett, now retired, became the general manager and remained in that capacity through the succeeding two changes in ownership. It was in 1963 that the Fortnightly Corporation bought both the TV and radio stations holding them through 1969. In 1970 the owners of the local cable system took over ownership of WBOY-TV as the Northern West Virginia Television Broadcasting Corporation in a compromise deal with Rustcraft over a non-duplication landmark court battle. The major stockholders of the new corporation were Count Max and Mrs. (Marion) Ascoli, Nathan Levin and John Borghi. In December 1976, WBOY-TV was acquired by Commercial Dispatch, Mr. Birney Imes, major stockholder. Joseph “Skip” Simms became manager and held that position until 1982 when Stanley T. Siegal took over as general manager/vice president, a position he holds today. "Skip" Simms was Vice President of the West Virginia Broadcasters Association at the time he moved from West Virginia. Stan Siegal has served a two-year term on the WVBA Board of Directors. Joseph Wright, the current chief engineer has been with WBOY-TV since the beginning having also held the same position with the originating radio station, WBLK, on the air in 1939. The current program director is Frances Basile who has been with the station since 1960. 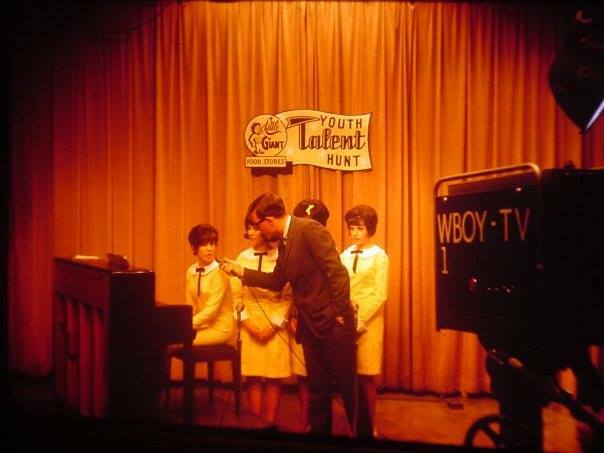 In addition to newscasts, a few of the live programs telecast when originally put on the air were: Boyland Bandstand, a teen dance program with records & live music and guests; Junior Auction; "Uncle Pete", children's show; Around & About Central West Virginia, interviews; Videoscope, news/talk show; Crippled Children's Live Telethon in the studios, guests included Virginia Graham, The Cisco Kid, Tommy Leonetti, Eddie Bracken; Live Fashion Shows; Live Miss West Virginia Pageant; Live College Quiz program ala G E College Bowl. 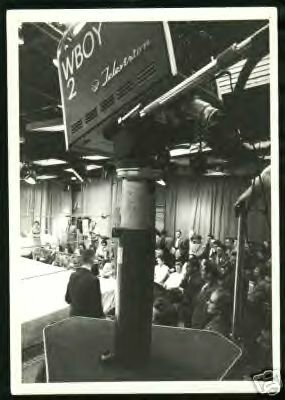 WBOY-TV in 1960 also did first live remote TV show from Carmichael Auditorium for the Home Show, with Arlene Francis as special guest. Three former employees now on the national scene are: Brenda Curtis-Heiken, U.S. Dept. of Agriculture Public Affairs Specialist-Radio/TV; Jay Randolph, currently sportscaster with NBC; and Mayf Nutter, now in Hollywood and who has also been seen in a number of national television shows. Currently, WBOY-TV has been winner of seven (7) Associated Press Broadcast Awards (1986) including Best Newscast, Best Investigative Reporting, Best Public Affairs, Best Coverage of Spot News, and Best Sports Special. 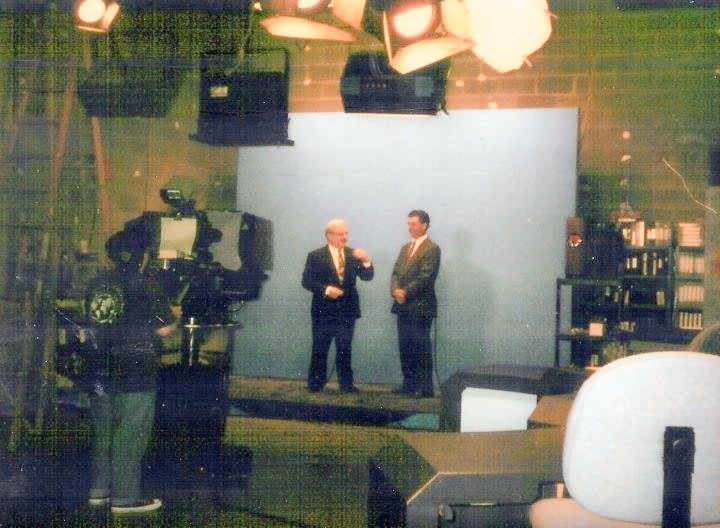 WBOY-TV-12 (celebrating its 30th anniversary in 1987) maintains a full time news bureau in Fairmont and Morgantown with a full-time bureau in Charleston during legislative sessions. 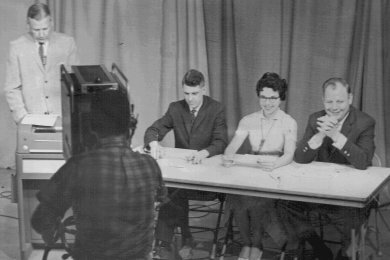 The noon newscast, known as "Videoscope," in 1962. Standing: anchor Pete Lyman. Seated (L to R) Jack See, Frances Basile, Bob Toothman. Photo courtesy of Jack See. Just after the talent show. Photo courtesy of Eric McGuire. Eric McGuire, guest weatherman, with Mike Simons. Photo courtesy of Eric McGure. 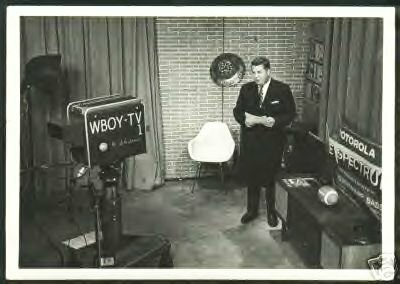 According to various sources, WBOY-TV began broadcasting on Nov. 17, 1957. John Cooper writes that for two years he did a daily kids show, Johnny Mountain, beginning when WBOY-TV went on the air. He did magic and had a studio audience of children. Cooper left to go to WDTV and Pete Lyman took over the time period as Uncle Pete. Cooper also says that John Peters was at WBOY-TV with him when the station opened. Peters later became station manager of WDTV. Photographer Milt Furner, who played Santa Claus at the station, took a photo of John F. Kennedy waiting to be interviewed in the WBOY-TV studios; the photo was displayed in the Channel 12 hallway for many years. The 1961-62 Broadcasting Yearbook shows the licensee as WSTV Inc. (original owner), part of Friendly Group Stations. Personnel are: Jack Berkman, president; John Laux, executive vice president; Robert O. Runnerstrom, managing director; Roger Garrett, general manager; Robert Toothman, program director; James Valentine, program manager; Peter Lyman, news director; Harry Brown, chief engineer. On March 11, 1964, the FCC approved the transfer of the station from Rust Craft Broadcasting to Northern West Virginia TV Broadcasting Co. The 1977 Television Factbook shows the ownership as Northern West Virginia TV Broadcasting Co. Ownership: Nathan W. Levin, president and treasurer, 10%; Marion R. Ascoli, vice president, 80%; Max Ascoli, vice president, 10%. Personnel: Nathan W. Levin, president, John J. Borghi, vice president, Roger Garrett, managing director and film buyer; Bob Toothman, program director; Joe Wright, chief engineer. Photo courtesy of John Cooper. Roger McCoy, emcee, walking by the ring.